The 15th leg on the 2018 Longines Global Champions Tour calendar sees eight out of the top ten in the LGCT ranking head to Italy’s capital city of Rome. With the championship pressure intensifying, and anticipation mounting, Rome marks the penultimate leg of the 2018 season fight, as all eyes look towards the all-important finals in Doha, Qatar. With just two places remaining for the GC Playoffs and the prestigious Longines Global Champions Tour Super Grand Prix, the very best international show jumpers will be in action from the 6th-9th September - all of whom will be vying for the LGCT Grand Prix win and a golden ticket to the Playoffs in Prague this December. And indeed the three week hiatus plays firmly into the overall ranking leader’s favour, where he heads to Rome on a score of 270 with fresh horses strategically selected for the Stadio dei Marmi arena. Should he do well, Ben mathematically has the opportunity to wrap up the 2018 LGCT title at the penultimate event of the season, only once before achieved by current reigning Champion Harrie Smolders (NED) - the Dutch star historically sealing the deal before the end of the season. The current World Number 1 will also be in Italy’s capital city, with Harrie on 234 points and looking to topple Ben off the top spot and keep his hopes of a second consecutive title alive. Local star Alberto Zorzi (ITA) will be looking for a boost from his home fans, the Italian rider just one point away from Harrie on a score of 233 overall. While the top three battle for supremacy, the midfield momentum has reached fever pitch. Daniel Deusser (GER), Edwina Tops-Alexander (AUS), Christian Ahlmann (GER), Scott Brash (GBR) and Christian Kukuk (GER) will all be in action for the 15th leg of the Championship, each looking to shakeup their points tally and head into the final in the best possible position. One of the oldest continuously occupied cities in Europe, Rome’s historic heart contains iconic monuments and artistic masterpieces from the magnificent Colosseum and the Pantheon to the Sistine Chapel and the ruins of the Roman Forum. Visitors can take in Renaissance palazzos and Baroque fountains or simply stroll through beautiful piazzas and soak up the vibrancy of the city of La Dolce Vita. 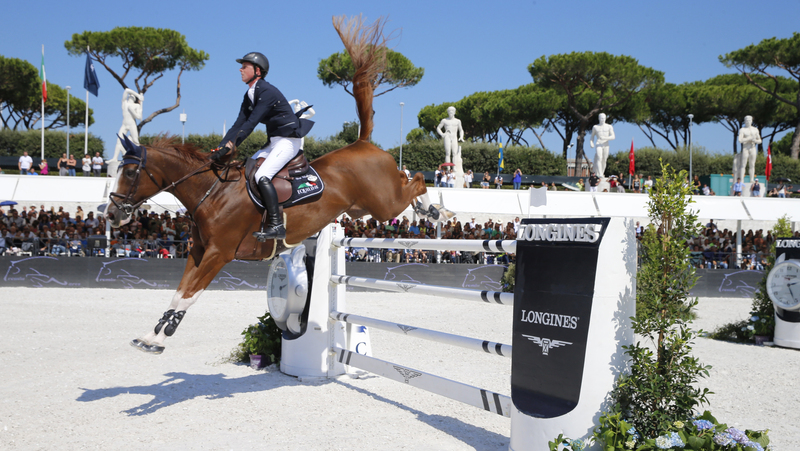 The Longines Global Champions Tour of Rome will be staged at the impressive Stadio dei Marmi for the fourth year running, a unique location which is ringed by 59 classical marble statues depicting different sports. Many of the biggest names in the sport will be in Italy’s capital city, including the likes of Ludger Beerbaum (GER), Lorenzo de Luca (ITA), Simon Delestre (FRA), Rolf-Goran Bengtsson (SWE), Olivier Philippaerts (BEL), Bertram Allen (IRL), Michael Whitaker (GBR), Roger-Yves Bost (FRA), Peder Fredricson (SWE), Pieter Devos (BEL), Eric van der Vleuten (NED), Henrik von Eckermann (SWE), Marlon Zanotelli (BRA), Denis Lynch (IRL) and last year’s winner Evelina Tovek (SWE).